Supermicro's first Xeon D-1567 System! Despite Typhoon Chaba and Hurricane Matthew related delays (slowing shipping from Taiwan to San Jose to Miami to Connecticut), it's here, one of the world's first Xeon D-1567 systems! Mine shipped out from Wiredzone in Miami mid-last-week, one of several shipped out that week, after the usual 4 hour memory burn-in test. It's likely the very first seen in the wild. This 12 core beast of a system wouldn't have existed at all if it wasn't for the many participants in the TinkerTry poll! I'm happy to present to you a detailed, uncut, and perhaps-too-thorough video of the entire unboxing, assembly, BIOS verification, and initial OS install procedure. That's right, no steps is skipped, and the leisurely pace allows you to follow along with me, in real time, as you prepare your Bundle 1, 2 or 3 12 core system for your OS of choice. You'll see it's all rather straight-forward, and if you make it to the end, there's some optional bits (and a 2nd M.2 NVMe drive adapter) that might be of interest to you in the future. Well, I realize 10TB isn't exactly typical. I really do use a lot of that space for backups and media, and it allows me to re-purpose 2TB and 4TB drives elsewhere, saving some watts too. 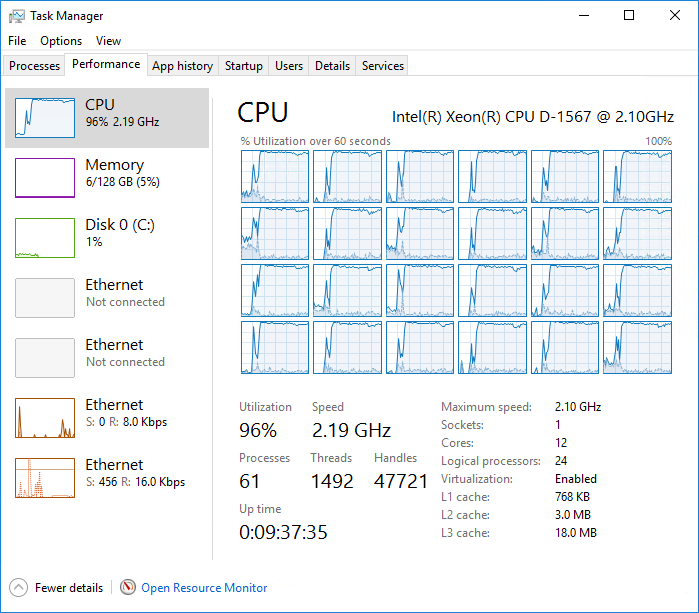 So glad my SYS-5028D-TN4T Xeon D-1541 now has a more powerful 10GbE-connected sibling, in time to create quite the VMware vSphere 6.5 cluster (Q4 2016)! New CPU Heatsink/Fan assembly is apparently called the SNK-C0092A4L for the Xeon D-1567, instead of the SNK-C0057A4L found with the Xeon D-1541. Note that this new Xeon D-1567 system isn't yet on the VMware HCL (Compatibility Guide), but the Xeon D-1541 has been for a while, and Supermicro is clearly working to fix this gap, as explained by Supermicro in the interview I recorded at VMworld here. Other than the core count and cache sizes, and a possibly better CPU heat sink/fan combo called the SNK-C0092A4L, these systems are completely identical, even the BIOS 1.1c. This is good, and should make deployment a snap, see how simple it is to install ESXi 6.0 and Window Server 2016 Hyper-V.
What are the other reasons this 4K video is unedited? "TinkerTry'd Supermicro SuperServer 5028D-TN4T Assembly and Windows 10 OEM build procedure" published on Aug 19 2015. 12 Core Bundle 2, just after I added 2 additional 32GB DIMMs, 128 Total [max].